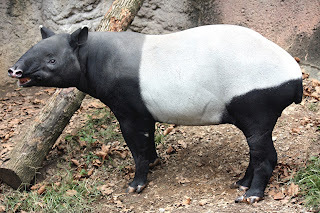 Largest of today's living tapir species, and the only one that is native to the Old World, the Malayan tapir Tapirus indicus is further distinguished by its striking 'saddle' of white, encompassing much of its torso and haunches. In total contrast, its four New World relatives are all uniformly dark. 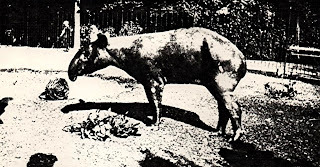 Naturally, therefore, zoologists were nonplussed when one of the adult Malayan tapirs sent to Rotterdam Zoo in spring 1924 from Sumatra proved to be entirely black, with no saddle. 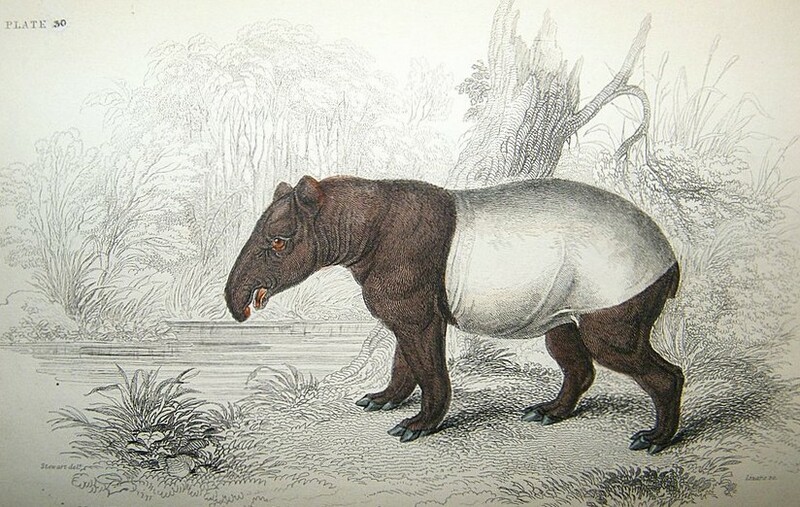 According to a subsequent paper concerning this singular animal by Dr K. Kuiper of Rotterdam Zoo (Proceedings of the Zoological Society of London, July 1926), there were no previous records of all-black Malayan tapirs, and not even Captain K. Brevet (of the Royal Dutch-Indian Army), from whom the tapirs had been received, had ever heard tell of such creatures before. Notwithstanding this, the Rotterdam specimen, a male, confirmed that at least one could (and did) exist. 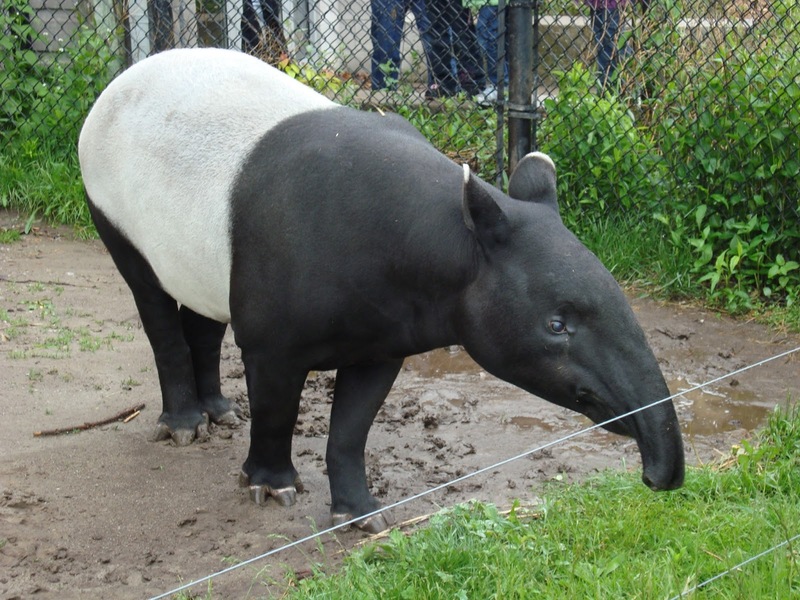 Moreover, when, just a few months later, Brevet sent two juvenile Malayan tapirs to the zoo, one of these matured into a second all-black individual (except for a small grey stripe on the median line of its belly). Yet although they were evidently Malayan tapirs, what was their precise identity, taxonomically speaking? Both specimens had been captured within the Babat district in the low-lying plains of Palembang, a district where the familiar white-saddled form also exists - thereby eliminating any possibility that they constituted a morphologically-distinctive geographical subspecies. And as these two mystifying individuals were both from this same region, with no reports of any all-black tapirs elsewhere, Kuiper also deemed it unlikely that they were merely the product of a simple genetic mutation - i.e. a melanistic (all-black) morph that could appear anywhere and at any time within any population of white-saddled specimens (like black panthers within populations of spotted leopards). Accordingly, Kuiper looked upon them as representatives of a newly-emerging variety, not replacing the white-saddled version in any specific area (and hence not a subspecies), but nonetheless possessing a specific geographical distribution. In July 1926, within his PZSL paper, he formally christened his newly-categorised variety Tapirus indicus var. brevetianus, in honour of its discoverer. However, it now seems much more plausible that this all-black form was nothing more than a melanistic mutant after all, because no further brevetianus specimens have ever been documented. 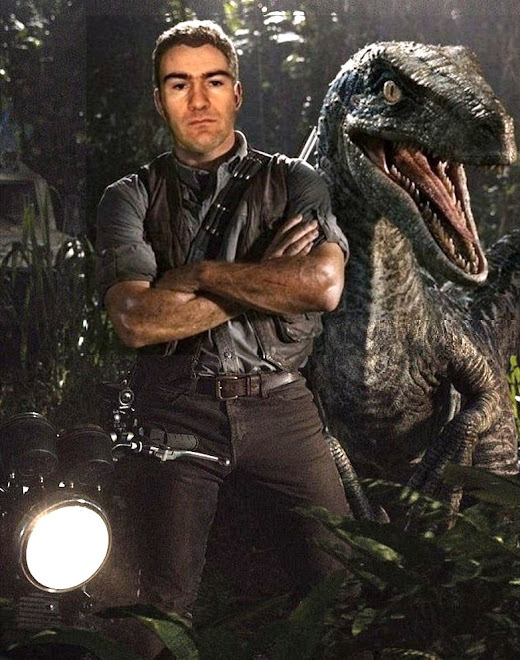 And both of the Rotterdam individuals died before any matings with white-backed specimens could take place - thereby denying science the opportunity of investigating the genetic basis of their uniformly dark colouration. Even so, their preserved remains at the Leiden Museum of Natural History bear silent witness to their erstwhile existence, and to the tantalising prospect that at some stage in the future, their kind will reappear, reviving the brevetianus zoogeographical paradox - the presence of all-black tapirs in the Old World. And indeed, after almost 80 years, that hypothetical stage in the future finally became the very real present, when in 2000, as subsequently documented by Mohammed Azlan J. of WWF Malaysia (Tapir Conservation, vol. 11, no. 1, June 2002), two separate all-black Malayan tapir sightings were recorded within Jerangau Forest Reserve, in Ulu Terengganu, peninsular Malaysia. 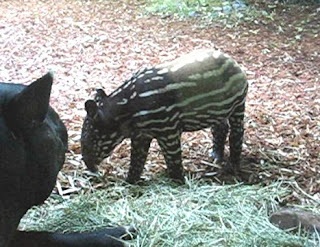 The first sighting took place on 9 July 2000 at 7.44 pm, when a motion-sensitive infra-red camera set up in lowland forest to monitor tigers obtained a clear photograph of a tapir that was wholly black, with no white saddle marking whatsoever. The second sighting, again the result of triggering an infra-red camera but this time set up in hill forest, snapped an all-black tapir at 1.13 am on 20 July 2001. These are the first, and currently the only, photos obtained in the wild of specimens of Brevet’s black Malayan tapir. Indeed, it might even be that both photos are of the same single animal, which may simply have moved from low forest into hill forest during the intervening year between the snapping of the two photos. Also, according to Wikipedia’s entry for the Malayan tapir, in September 2003 Canadian researcher William Sommers witnessed the live birth of an all-black Malayan tapir in the wild. If correct, this is particularly intriguing, because tapirs of all species are normally born striped, only losing their markings as they mature (as was the case with the second all-black Malayan tapir at Rotterdam Zoo). In any event, Azlan’s photos provide conclusive evidence that Brevet’s all-but-forgotten melanistic mystery beast still exists - albeit most probably as an exceedingly rare mutant limited to a couple or so individuals in every generation. And its unexpected appearance in Malaysia, greatly expanding this form’s known distribution, substantiates my belief that it is indeed a mutant morph capable of appearing anywhere within the total Malayan tapir population. Benefiting from modern-day advances in DNA analyses, and with at least one contemporary specimen in existence, it would be fascinating to investigate the genetic make-up of Brevet’s black Malayan tapir, and finally establish after many decades of scientific obscurity the true identity of this enigmatic creature. They just look so cuddly! But, yeah, they're cute. Especially the babies. Sorry, I put up a link to that story then flippantly followed it with a winking smiley specifically because it was a response to The Thinker's comment, not because of a casual disregard for the welfare of those involved. It was thoughtless of me. A small child and her mother sustained serious injuries. :( Apologies! Speaking of tapir, I am looking forward to hearing more about tapirus bairdii dowii, seems like it deserves to be elevated to the species level.